Goodbye Table rate shipping Zones? As we work through the upgrade of customers website with WooCommerce 3, there is one plugin that I have been recommending for years, that could be redundant on some customer sites. 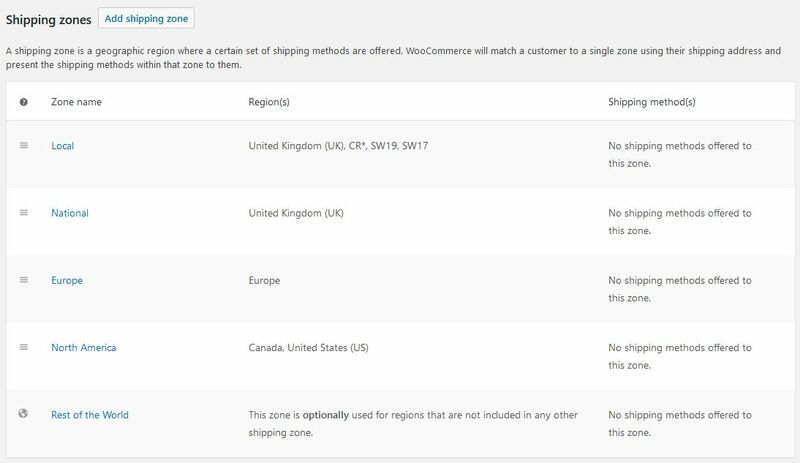 Shipping zones support was introduced in version 2.6 and many people could have stopped using it then, but all the talk about Woocommerce Version 3.0 and the changes it offers us now, has more customers looking at what they are using. And so the issue has been more talked about. This plugin has been a great stalwart of any site when you wanted to be able to ship based on a number of different package sizes, and with rules for different locations. Typically customer would have a book-sized package, a larger T-Shirt sized package and then a large carton for bulkier objects. Therefore leaving around 3 or 4 sizes of orders. The delivery charge for an envelope is much smaller than that of a 15KG carton, so these charges make a big difference to check out sales. The delivery region can also have big differences. based in the UK, national, European, USA and the rest of the world rates vary and need to also be taken into consideration. BEFORE YOU UPGRADE, Let’s SEE IF YOU CAN DROP TABLE RATE SHIPPING. For everybody else, you may want to choose to ‘Ship to all countries you sell to’ and choose the countries you sell to. In the Shipping Zones, you can now create the zones into which you wish to ship, with the plan that we can have difference shipping prices to these zones. I suggest you setup all the zones you can ship to first. You are not just limited to counties. For the UK, I have chosen local post |(zip) codes for some local delivery/pickup options. You can also take advantage of ‘Rest of the World’ for those places you have not specified. You can see my example below. This can help ‘clean up’ the checkout. 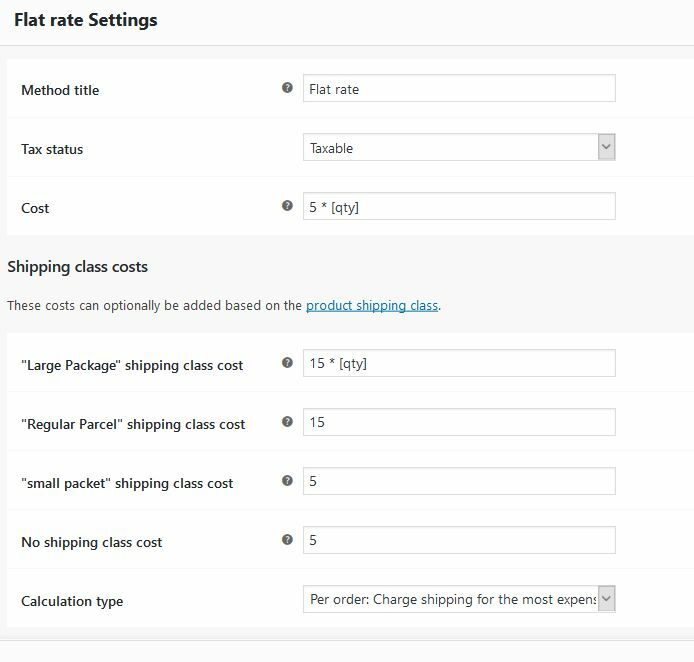 Keeping the shipping calculator off the basket page and hiding the shipping costs till the address is given can make things look better. You need to consider if that will be acceptable to your target customers. You can choose whether to take the customer shipping address or billing address for shipping calculations. You may wish to force shipping to the billing address, which is a preferred rule for many credit card companies. Now if you return to edit your shipping zones, you can start to add the shipping methods for each zone. For my local defined area with postcodes, I can give a local pickup and free shipping options. This can be based upon a minimum order amount and/or a coupon code. You will now find listed the shipping classes that you just defined. Set a class cost fo each one. For orders with multiple items in different classes, you have the option to charge for each, or just the most expensive. But, wait. You don’t just one flat rate option. You can add multiple flat rate options. For instance, you could offer a fast shipping method like before 12 am or 9 am. 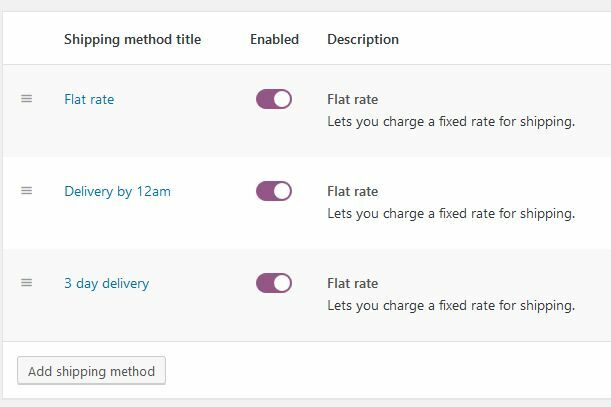 Add an additional flat rate option and then rename it and change the delivery prices. The cost box is not limited to just a single value. You can also create calculations. [fee percent=’10’] Price is 10% of the total for that class. By breaking the deliveries into zones, we now have the opportunity to charge different rates for our sizes of the parcel based upon which zone they deliver to. You may find that the latest delivery options can cope with the site requirements. Some sites set up their shipping methods to match an older version of Woocommerce. The more flexible options could help with more accurate delivery charges which also can mean more sales with better pricing! If you have attractive delivery options like premium faster delivery or Free delivery over a fixed value, then you can use these to upsell the buyer! Where you may still need table rate shipping and other plugins. If you want different rates based upon the number of items, then you still need to consider table rate shipping. e.g. Many customers price delivery for one item, and then a lesser price each subsequent item. Does your logo look good in any size? Is Google happy with your site?